Blue zircon is created by a heat treatment of natural brown zircon from Cambodia, Vietnam, Thailand or Brazil. Cambodia is the prime source of natural zircon that will turn blue with heat treatment. The depth of blue can range from a light Sky Blue to a deep, electric, vivid blue. 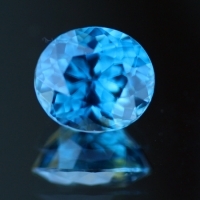 Color is a big factor in the price of blue zircon. Zircon is a natural mineral mined from the ground and should not be confused with (CZ) cubic zirconium which is a man made material. Natural zircon crystals found in Australia have been dated as being formed 4.4 billion years ago. This makes zircon one of the oldest minerals on planet earth. Blue zirons are highly prized for their color, brilliance and are highly doubly refractive. When viewed through the table of the gem the back facets appear to double. This is a unique doubling effect adds beauty and brlliance to the gem. Zircon has a hardness of 7.5 on the Moh's scale making them very hard sratch resistant gemstone but, Zircon is a brittle gemstone that is suseptable to chipping or abrading of the facets. Zircon should not be worn on the hand unless well protected by the setting or surrounding gemstones. Zircon is an excellent choice for all other types of jewelry. Zircon has been used in jewelry for well over 2000 years. Zircon was believed to provide the wearer with wisdom, honor, and riches, and the loss of luster was said to warn of danger. Fine grade gemstones from Cambodia. Matched Pair. Fine Grade gemstones from Cambodia, Matched pair! Fine grade gemstones from Cambodia. Matched Pair! Extra fine quality blue zircon from Cambodia. Extra fine grade blue zircon from Cambodia. Extra fine grade gemstone from Cambodia. Extra fine grade natural blue zircon from Cambodia. Huge gemstone.